It seems like everything is memory foam these days. Memory foam slippers. Memory foam pet beds. Even those eye covers come in memory foam options. There’s a reason why, too. Memory foam is comfortable. Memory foam doesn’t have springs that sag or start popping. Memory foam is consistent. Would a mattress made of memory foam also have all of these traits? I certainly hoped so. As part of our Nature’s Sleep Ambassadorship, we received a Nature’s Sleep Tobago Mattress to test out and to see how it can help us get a better night’s sleep. When the mattress first arrived, I was a little surprised. It came in a box. I’d never seen a mattress in a box (other than those air mattresses) and I pondered how a King sized mattress could even fit inside. But a mattress was inside (video with “proof” coming soon) and after just a few minutes, the Nature’s Sleep mattress was out of the box. Once we cut away the plastic wrap, we unrolled the mattress, waited and watched until it seemed to expand to full height. 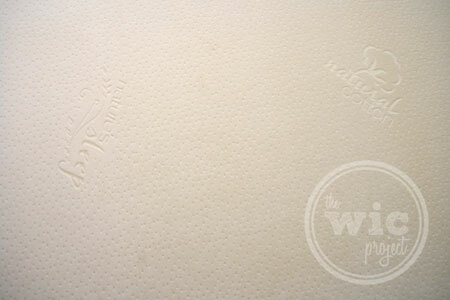 It’s difficult to communicate exactly what makes the Nature’s Sleep Tobago Mattress so comfortable. It’s not any one singular trait that makes it awesome, more so a combination of things. It’s soft and plush but isn’t saggy. The mattress seems to envelope you and provide support exactly where it’s needed; think your lower back and neck. It feels like you can truly and completely relax – like really, really relax. The Nature’s Sleep website says that the mattress evenly distributes your weight across the bed, and let me tell you, it does. It’s almost like you’re floating. Since the mattress is made of memory foam, it provides the same comfort and support whether you’re sleeping in the middle of the bed or the edges. 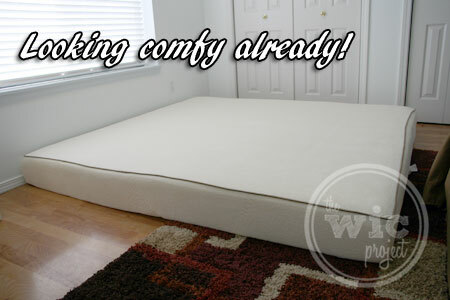 This is great for people who might move a lot in their sleep, since the mattress doesn’t have any springs that can affect your motion or sleep. Another great bonus with this Nature’s Sleep mattress is that it sleeps cooler than other memory foam mattresses. Their “Advanced Visco Technology” allows the air to pass through the foam so it doesn’t trap your heat as you sleep. I really appreciated that the mattress came with this lovely cover. It’s zippered on the other side for easy removal & washing! If you’re in the market for a new mattress, I encourage you to check out the memory foam mattresses from Nature’s Sleep. They can definitely help you get a good night’s sleep. If you like what you see (and read), keep an eye out for one of the Nature’s Sleep sales to help you save on your purchase. Stay tuned in the coming months as we share more about the Nature’s Sleep Tobago mattress as well as some of their other amazing products – like their memory foam pillows! Would you like to win a Nature’s Sleep memory mattress to try out yourself? Head over to the Nature’s Sleep Facebook page and enter to win the Nature’s Sleep Sapphire Gel Mattress. 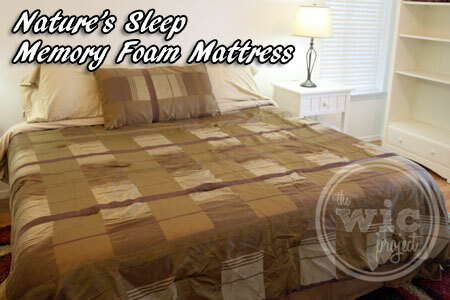 Do you currently sleep on a memory foam mattress? I bet this mattress is so comfortable. The next bed I get, I am getting one of the Nature’s Sleep memory Foam mattress. They are worth the money! This mattress sounds amazing! I have a regular old spring mattress and lately when I wake up in the morning I have all sorts of aches and pains, mostly in my hips and shoulders. I’m willing to bet it’s because my mattress is worn out. I sure could use one of these instead! I so want one of these. I need a new mattress. Really great review, I want one! This looks like it would help my back. I’d love to get one! I have a family member who has a memory foam and I so want one. This mattress looks awesome. My daughter and granddaughter have memory foam mattresses and they are just wonderful. I will be buying a new mattress when I move and this sounds heavenly. No sunken in places, although I’m not that heavy, lol. Great pics getting it set up. I have never seen anything like this. It would be amazing to try one of these mattresses out. The more reviews I read, the more I really want these products! Thanks for sharing! So expensive, but according to all the reviews I’ve read, so worth it! I would be so grateful to win this little piece of heaven. Sounds very nice. Thanks for posting pics. I do not have a memory foam mattress, but I really think I need one. And Hubby really needs one. 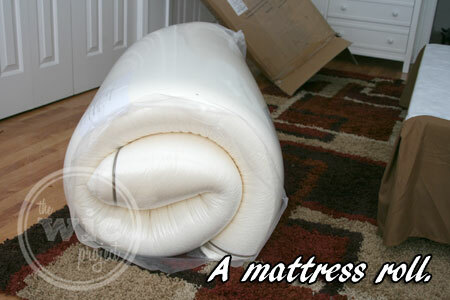 great review – I would love to replace our mattress – I am leaning towards memory foam. The mattress looks so comfy. I would love to be sleeping on one this evening. Wow, what a great mattress, wish I had one of these! I don’t know how much longer I can wait to get a new bed. I desperately need one after an accident. This looks so inviting. It’s amazing how compacted it was and becomes so full! I don’t sleep on a memory foam mattress. My inner spring mattress is lumpy. (And so am I !) Hard to believe that BIG mattress fit into that carton! This looks really nice. I would love to have this. Great review! The more I read about these mattresses the more I want one! Wow, that mattress looks awesome! So neat how they can fit a whole entire mattress in a box! I thought as I was scrolling down that it was going to look thin, but it looks the width of an average mattress! Really like that it doesn’t add heat!!! those warm summer nights really need a cool foundation. 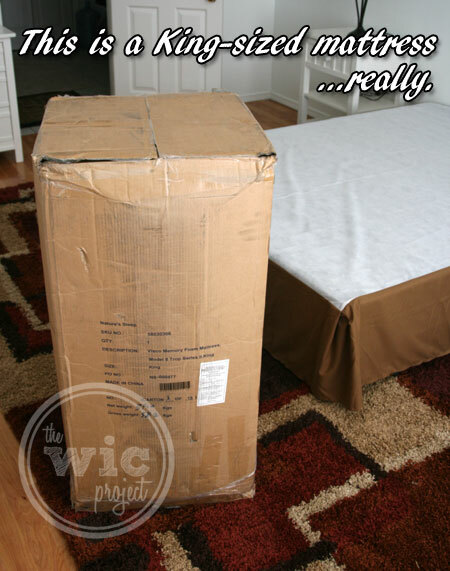 This mattress is amazing – and not just for how it is shipped and delivered. I’d also like to try the pillows – my husband has always been the one to get the fancy pillows and it is my turn! Can’t wait to get one. Anything is upgrade from our mattress! But have to wait till holidays are over to purchase a new one. Great review. I want one! I think it’s time for me to buy a new mattress, this looks so comfortable. 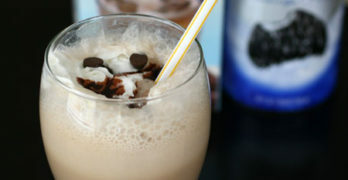 Thant’s for the review. I pick this mattress for a good night’s sleep. I can’t wait to have one of these. That was amazing how a king size mattress came out of that box. Great pictures! The bed looks very comfortable! It’s nice that it sleeps cooler then regular mattresses. I can’t wait to try a gel mattress! That sounds like heaven! Wish we could afford on of these! I don’t currently sleep on a foam mattress but my sister has one in her guest room (how cushy!). I’d love one at my own house to ease my poor tired bones! We don’t have a memory foam mattress but it really sounds amazing, I love that it makes you feel like your floating! Thanks for the review! I have always been suspicious of memory foam mattresses mainly because I though of them as retaining heat. According to your review, however it seems that is not a concern. We may have to go to a store to actually lay on one before we decide to switch. Thanks for the post.